Press Release: July 30, 2018 by Sanman Promotions – Fighters from the Sanman Boxing Gym scored a clean sweep in the 11th installment of the 11th Brawl at the Mall card on Sunday night, July 29, at the packed Robinsons Mall Atrium in General Santos City. Sanman fighters went seven-for-seven with Jade Bornea leading the onslaught as he scored a third-round knockout win over Alvin Bais of Sarangani Province. Bornea of Sanman-Amoy remained unbeaten as he improved to 12W-0L-0D, 8KOs. 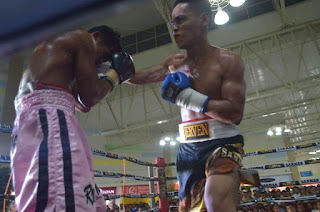 Jerven Mama pulled off a fourth-round technical knockout (TKO) win over Cebu's Ryan Tampus, while Jerry Francisco prevailed over Davao's Gerald Alvarez via unanimous decision. Richie Mepranum eked out a majority decision win over Bukidnon's Rodel Tejares, while Adam Diu Abdulhamid needed just two rounds to knock out Philip Parcon of Davao. Judy Flores scored a resounding first-round KO victory over Sarangani's Paolo Perono and also coming up with an impressive performance was Presco Carcosia, who knocked out Rey John Indita of Bukidnon in the second round. The main event showed Jasur Akhmadjonov of Uzbekistan settling for a draw with Cebu City's Rodel Wenceslao. Akhmadjonov's compatriot Ulugbek Sobirov emerged triumphant following a first-round KO win over Baguio City's Dennis Padua. Another visiting fighter was also victorious as Rajan Nadarajah of Malaysia defeated Davao's Junrix Saldivia via unanimous decision. In other fights, GenSan's Virgil Deguma scored a fifth-round KO win over Davao's Michael Padayag, while Ranjo Napoles also of GenSan nipped Ador Torres of Baguio via unanimous decision. Material courtesy of: Sanman Promotions/Photo courtesy of: Jerven Mama Used with permission. For more information about Sanman Promotions and to watch the Sanman Live Brawl At The Mall Boxing series please visit Sanman Promotions’ official Facebook page: www.facebook.com/SanmanPromotions.